It was a fresh faced looking trio of Harriers (well 2 of them actually) who made the trip up the A9 to join the Birnam Hill Race last weekend. Kirsty Combs and Chris Grant-Pantry were both making their debut in Blue and Gold and did not disappoint (in Kirsty’s case only theoretically as the powers that be had failed to provide a club vest!!…apologies!). Near perfect conditions on the day made for a fast race over 6.5k and 450m of climb in the forests adjacent to the river Tay. Chris stormed home in a magnificent 4th place (32.15) and Kirsty was equally impressive in 72nd (45.03). The slightly less fresh face belonged to Bill Breckenridge who finished in 13th (35.08) and 2nd MV50. The race was won by Andrew Douglas in a new course record of 28.06. Two weeks previously saw the first of the club championship hill races taking place at Criffel, Dumfriesshire. Only 2 Harriers made the start line for this notoriously muddy 10.5k race but it was all about quality, not quantity with Steve Winter barging his way to the front end of the field to take 2nd place and 1st V40 in a time of 1.00.21. Pocket rocket, Walter Henderson also finished in the top 10 taking 8th place (2nd V50) in 1.03.57. The race was won by Ricky Lightfoot in 53.56. Saturday saw a number of budding youngsters making the trip to the shores of Loch Lomond for the junior Ben Lomond hill race. There were races for junior boys and girls at U15, U17 and U20. Great to see this event being supported by the club with Malcolm Patterson in charge of organisation and our own Tom Owens, Shona Robertson and Walter along to help out with marshalling and giving encouragement to the hill stars of the future. We also had representation on Saturday at the classic Coledale fell race in the Lake District. Paul Cornock who has recently joined from the illustrious, Keswick AC also made his debut for the club. After being based in Swindon for a period, running on the hills was a welcome change for Paul. Despite some snow on the summits, it was a cracking sunny spring day, near perfect conditions for racing. The lack of water was an unusual problem to have in April. The race was won again by, Ricky Lightfoot on his own patch in a time of 1.13.03. Paul had a solid run finishing in 75th and I managed 22nd, a minute adrift of a top 3 MV40. 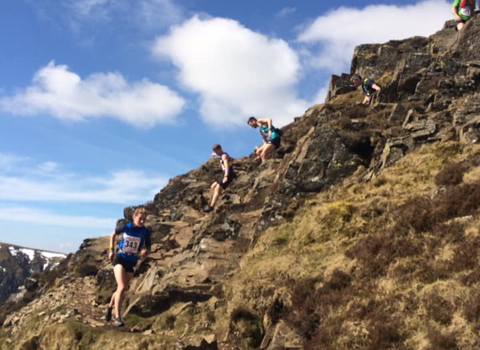 The first race in this year’s Scottish Hill Running Championships is fast approaching which takes place on Saturday 13th April at Screel, near Dalbeattie. Entries are still open for anyone who fancies a crack at this short race over 6.4k and 400m of climb. https://www.entrycentral.com/event/109886 Please get in touch with me pmackie77@aol.com if you are interested in racing at Screel.